RIO DE JANEIRO: Scores of ticketless Chilean fans gate-crashed the Maracana Stadium on Wednesday, breaking through fences in a desperate rush to see their team's World Cup game against Spain, leading to 85 arrests. It was the second time football fans broke into the iconic Rio de Janeiro stadium this week -- an embarrassing security breach at the arena that will host the July 13 final. The fans, many wearing Chile's red jersey, shattered a glass door at the media center at the iconic stadium in Rio de Janiero, broke fences and partition walls, and swarmed into internal corridors before security guards stopped them. Federal police said in a statement that it was giving the 85 fans 72 hours to leave the country, "or they will be subject to summary deportations." 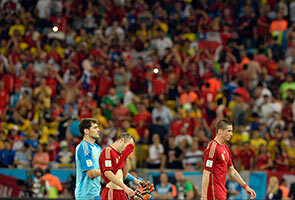 FIFA said none of the intruders had made it into the stands, missing their team's stunning 2-0 victory, which qualified Chile for the second round and sent defending champions Spain crashing out of the tournament. The football governing body said the situation was "brought under control quickly." "The organizers of the FIFA World Cup condemn these acts of violence," it said in a statement. But a security guard said some had traversed a tunnel leading from the media center to the pitch and been lifted up into the terraces, appearing to slip into the crowd. The security breach took place despite a vast security net put up by authorities concerned about protecting fans from crime and the type of violent anti-World Cup protests seen at last year's Confederations Cup. Danielle Figueiredo, a Brazilian volunteer at the media center, said the incident, which happened about an hour before the match, was "super scary." "It was an invasion of Chilean supporters with no tickets. They wanted to come into the media center and watch the game for free. They smashed the door... I think there were as many as 100 of them," she told AFP. An AFP correspondent saw police take away 24 young men, most wearing Chilean jerseys and many holding up papers in front of their faces to avoid being filmed by cameras. Two of the young men proclaimed their innocence as police led them away. "There was a sudden surge of people outside the center and I got swept up in it. I don't know why I'm here. I haven't done anything wrong," said one. "I didn't do anything. Why are we being taken away?" said another. The incident took place despite the presence of 1,500 security staff at the stadium, plus about 5,000 police on duty in the surrounding area, a security guard told AFP. It came after a group of fans in Argentina colors smashed through an entry gate at the same stadium before the country's first World Cup match Sunday. An amateur video of that incident posted online showed about 30 fans, many in Argentina jerseys and one wearing a Diego Maradona wig, jumping a wall and crashing through a gate to flood into a restricted area, overwhelming several security guards ahead of the Argentina-Bosnia game. Nine people were arrested, said the local World Cup organizing committee. They were released without charge after being booked and put on file. FIFA said it would address the media about security issues on Thursday.